With Pet Shop Boys taking over the 6 Mix on Friday night and their 12th studio album out next week – we thought what better time would there be to ask you to pick the Ultimate Pet Shop Boys Playlist on Now Playing. 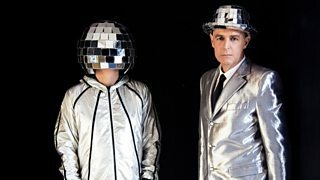 Having sold over 50-million records worldwide and listed as the most successful duo in UK music history by The Guinness Book of Records, Electric marks the latest chapter in Neil Tennant and Chris Lowe’s career, which has spread over three decades, a host of classic tracks and a wardrobe to befit even the most fervent of shopaholics. And you can stream Electric right now at Rdio. They spoke to Dave Pearce about the new record last weekend on Radio 2 which you can still listen to on iPlayer and on Friday are playing some of their current favourite tracks on a special 6 Mix – but what makes it into the Ultimate Pet Shop Boys Playlist? Only you decide that. Helmet wearing dance music duos? As always you pick the music so let us know what you want to hear by leaving a comment here or on our Facebook page, Tweet #psb6Music, send us an email with your suggestion and reason to nowplaying@bbc.co.uk or add a track to our collaborative Spotify or Rdio playlists.